Few consumer goods have ever existed that are as controversial as the automobile. Sure, it would be easy for us to sit here and list off all of the benefits that the car has had on our society, from transforming the face of industry to influencing infrastructure and allowing just about anyone to go just about anywhere. However, with all the benefits associated with the car, it has come a cost, an environmental one, and one whose full force is only being realized today. Fortunately, the evolution of the car has evolved alongside the forward thinking of man, and while many would argue it was slow and a long time coming, it seems that at long last a new age of automobile is upon us – the age of the electric car. Whether you choose to view the electric car as a response to a global environmental issue or as a natural progression in the quest for a better product, one thing that cannot be ignored is that it does come with its own unique benefits over its gasoline or diesel guzzling counterparts. So what are some of the advantages of owning an electric car? Perhaps the biggest appeal of switching to electric is the fuel economy and with the seemingly ever rising gas prices, who couldn’t use a break from the pump? In terms of efficiency, an electric motor is hands down the more efficient choice. By comparison, an electric motor can transform roughly 60 percent of its stored power into energy; while a conventional gas motor can only convert about 20 percent of their potential energy. However, the benefits don’t just end at fuel economy alone. In terms of performance, most first time drivers of an electric vehicle are amazed at how smooth, powerful and responsive they feel. And the commonly held misconception that electric cars are slower than electric ones couldn’t be further from the truth. When it comes to maintenance, electric vehicles also have a leg up on their gasoline brethren, as an electric motor usually only has a single moving part, compared to gas engines which are incredibly intricate. The only limitation is that the battery will need replacing as they have a limited lifespan, at least, for the time being. While it should seem now that electric cars already come with their fair share of benefits, we aren’t finished just quite yet. For while it is unlikely that most of us will feel the full brunt end of global warming in our lifetimes, the fact remains that we on this planet now have a responsibility to those future generations to provide them with an uninhabitable home. And on that note, electric vehicles significantly reduce carbon emission and in turn, the owner’s carbon footprint. And as if that wasn’t enough, many governments – including the US and Canada – have instituted tax rebate programs with the purchase of a new electric car. Oh, and did we forget to mention that for the most part, this present day batch of electric cars is pretty darn good-looking and stylish? Whether it is this year or in the next decade, chances are that most of us are on course to purchase an electric car sooner or later, and if that time is sooner, then we have some choice selections for you to take a look at. Much like regular cars can often be a hit or miss when it comes to quality and consumer appeal, so can be said for the electric car. Which is why we have gathered only the best electric vehicles on the road in 2017, just in case you needed a little extra help deciding. While BMW has always been a cutting edge manufacturer, often either redefining or heavily influencing the class of cars it produces, the i# is unlike any other BMW on the market. 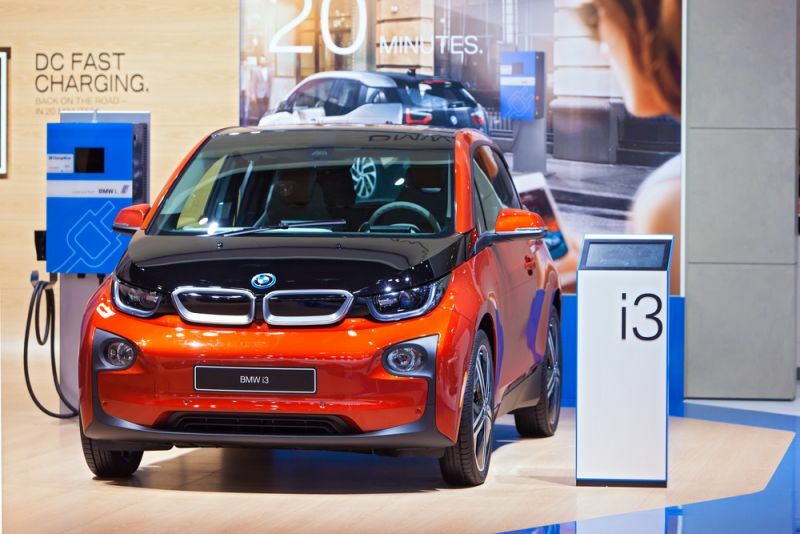 Sticking with its rear-wheel-drive tradition, the i3 boasts a 168hp electric motor in the rear, and also come with an available Range Extender (REx) which is an optional two-cylinder motorcycle engine that is designed to keep the batteries topped off and potentially double the range. Without it, you are looking at a modest 80 to 125 miles depending on your driving style. We have always been fans of BMWs and while this is a good entry into the electric vehicle market, especially given the car's carbon fiber body, we feel that this car is capable of a lot more. And with an MSRP starting off at $42,400, you do get your BMW bells and whistles, but in terms of performance for price, you may want to keep shopping.